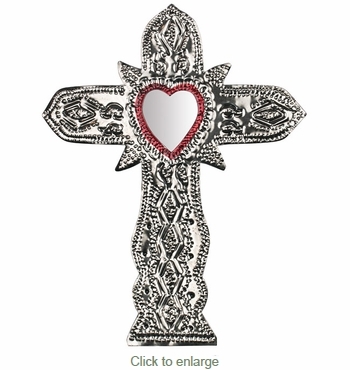 Each Mexican tin cross with inset heart mirror is hand embossed with a beautiful folk art designs. This folk art cross can be displayed anywhere in your home or given as a special religious gift. Each tin cross is handmade in Mexico by metalcraft artisans. Sold in sets of two crosses.